It’s been said that anyone can start a movement — beginning with themselves. George Fox, a man barely in his twenties, did that in England in the 1650’s. He grew up surrounded by social and political disturbances, and troubled by religious doubt. He was a Christian looking for something beyond the formal church teachings of his time, and his ideas attracted followers when people seeking something different heard of him. What were those ideas? Simple but radical. A human being can have direct communion with God, without going through another human (a minister), an institution (the church), or a book (the Bible). Ordinary people can sit together anywhere in silent worship, seeking a Presence and listening for the voice of God, seeking Truth based on direct experience. Because each person has ‘that of God’ inside a spirit of Christ, a Light each is linked to God and each other. Outward differences in life become unimportant. All are equal, and can speak to ‘that of God’ in others. All life – all days, all places – is sacred. The implications of these ideas were and still are far-reaching. Friends would not carry weapons against another person, or pay taxes to support armies. 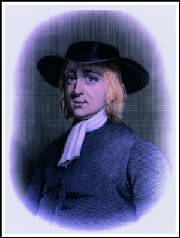 Fox once wrote that he ‘lived in the virtue of that life and power that took away the occasion of all wars.’ The early Quakers acted on the premise that love will work as a way of life, and championed the cause of the less fortunate the poor, dispossessed or jailed in those hard times. Believing all equal, they refused to honour the custom of taking off their hats, bowing, or using the respectful ‘you’ (instead of the informal ‘thee or thou’) with folks of higher social rank. They wouldn’t use titles. All were called by their full, or first, names. They rejected the established church, actively stirred people against it, interrupted sermons, caused disturbances and were arrested. When brought to court, they refused to swear oaths on the Bible, stating that there was only one standard of truth, which was what they used daily anyhow. Authorities considered Quakers dangerous heretics, imprisoned many, and took their property. Fox himself, Margaret Fell, often called the Mother of Quakerism, members of her family, other early preachers, young and old, were all in the terrible prisons of the time. Late in life, George visited friends in Barbados, Jamaica, and the American colonies, other Quakers went to Europe and the Middle East. Persecution only really abated in the 1700’s. Quakerism is now strong in many African and Central American countries. Its extent can be explored through Friends World Committee for Consultation.